When I write about restaurants on Instagram, they’re usually brief takes accompanied by a photo or two. (You can see my feed right here on ethnojunkie.com, updated almost daily, by selecting the “Instagram” category from my home page – no signup required.) But because of Instagram’s character count limitations, it’s often necessary to break up a review into several parts. This one originally appeared as six posts, published on March 25 through 30, 2019. I may be late to the game in terms of writing about MáLà Project, 122 First Ave in Manhattan, but that doesn’t stop me from working my way through their menu now. Their famous Dry Pot notwithstanding, four of us set out to explore other menu items, so we started with ten (count ’em ten!) dishes from the Appetizers, Snacks, Vegetables and Rice sections of the menu; I’m posting a barrage detailing the whole lot. I’ve been nibbling my way around roast poultry necks since I was a kid. At Thanksgiving, some families argue over politics; we argued over who’s going to get the turkey neck. So I was happy that there were enough MáLà Duck Neck joints for the four of us. I don’t recall these being particularly spicy though, neither má nor là. Good anyway. Fuqi Feipian 夫妻肺片 is a Sichuan málà classic. 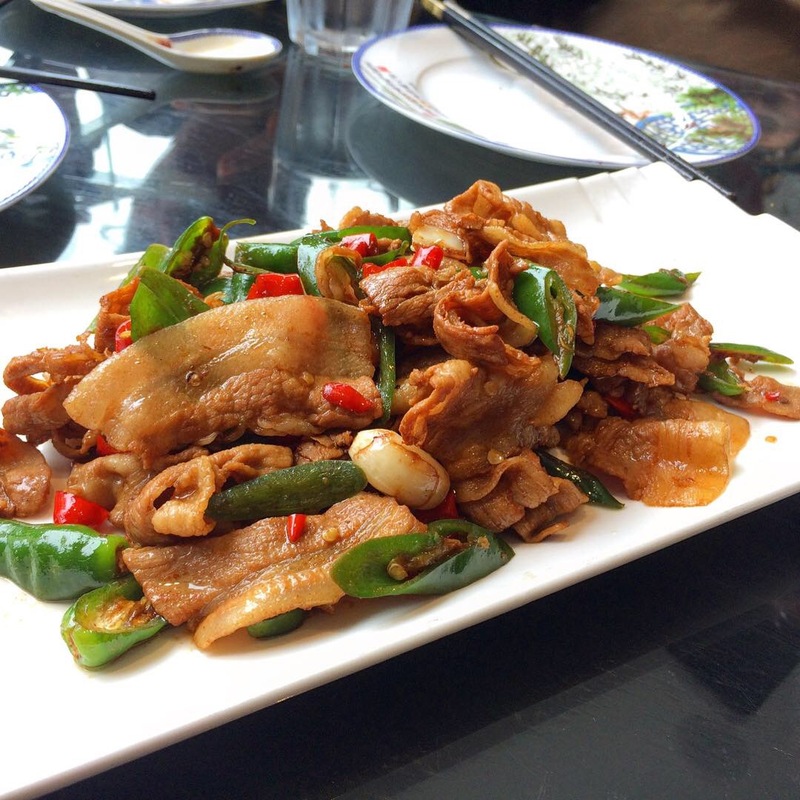 Choice of specific ingredients varies among chefs (not to worry, it never includes actual slices of lung) but tripe and tendon are traditional and ox tongue and beef shin can appear as alternate paramours – always two items though and always delightfully spicy. 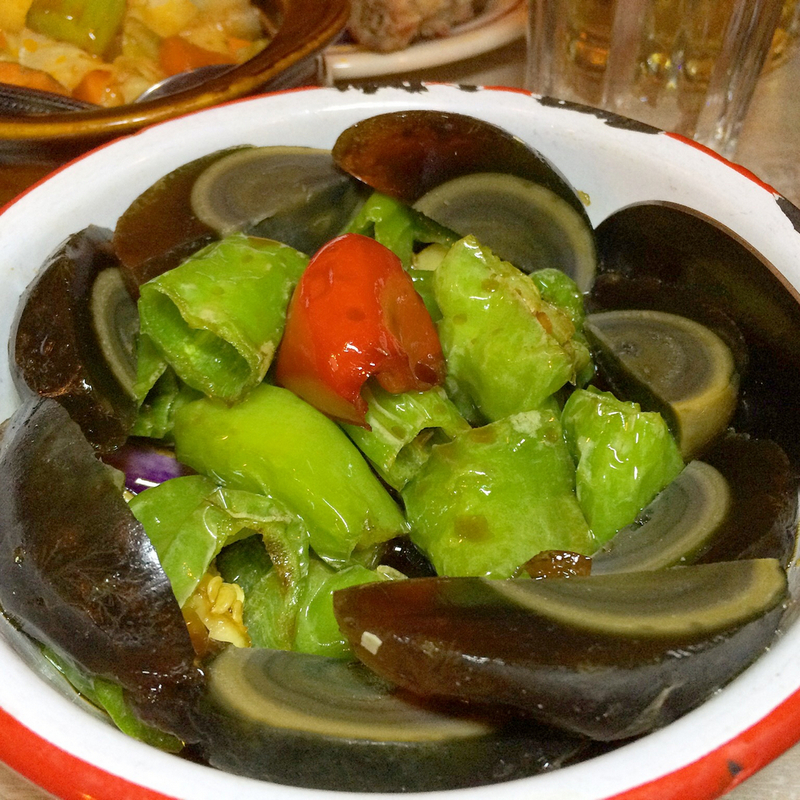 MáLà Pickles, 四川泡菜, from the Snacks section. Just what it sounds like: Sichuan homestyle spicy pickled vegetables of sufficient variety that we worked our way to the bottom of the crock with ease. Shāo jiāo pídàn, 烧椒皮蛋. These eggs are of a certain age, but not in sync with their moniker; thousand year eggs, also known as hundred year eggs, century eggs and preserved eggs undergo a process that actually takes closer to weeks or months. They’re covered in a mixture of lime (the calcium compound, not the citrus fruit) and salt and packed into clay or ash to cure (a bit of an oversimplification, but you get the idea). As you can see, the yolk becomes greenish grey and the white a gelatinous translucent brown. The funky flavor pairs perfectly with the fried spicy green pepper. 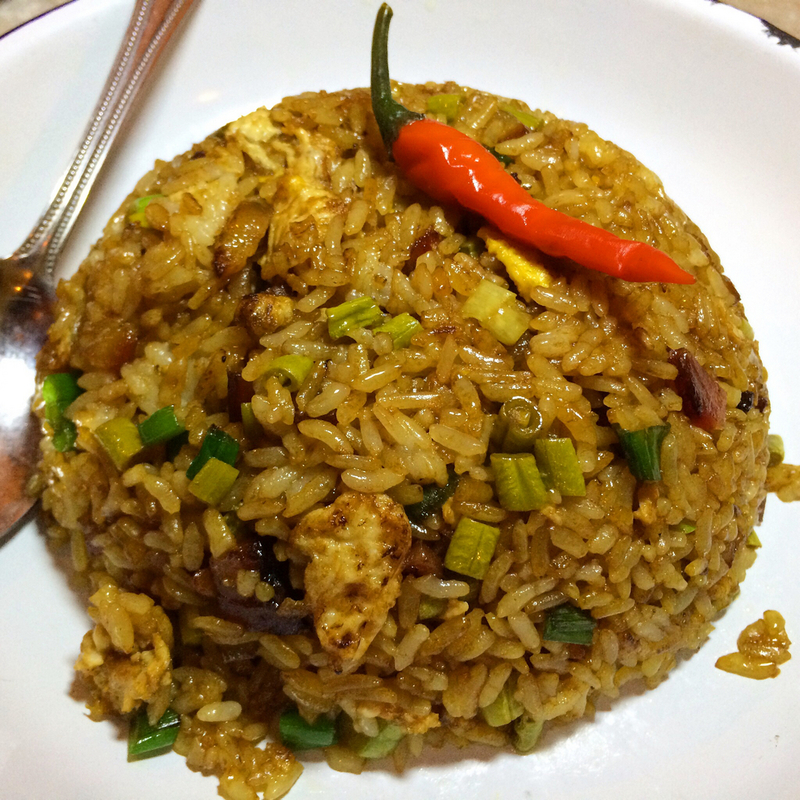 Xiangxi Fried Rice, 湘西炒饭, with egg, Chinese bacon, pickled vegetables and chilies. The waiter informed us that it would be spicier than its menu mate “Leftover Fried Rice”; I believe him having not tried the alternative, but this portion, although certainly delicious, wasn’t especially fiery. Good comfort food though. Liangfen of Happy Tears, Shāngxīn Liángfěn, 伤心凉粉. 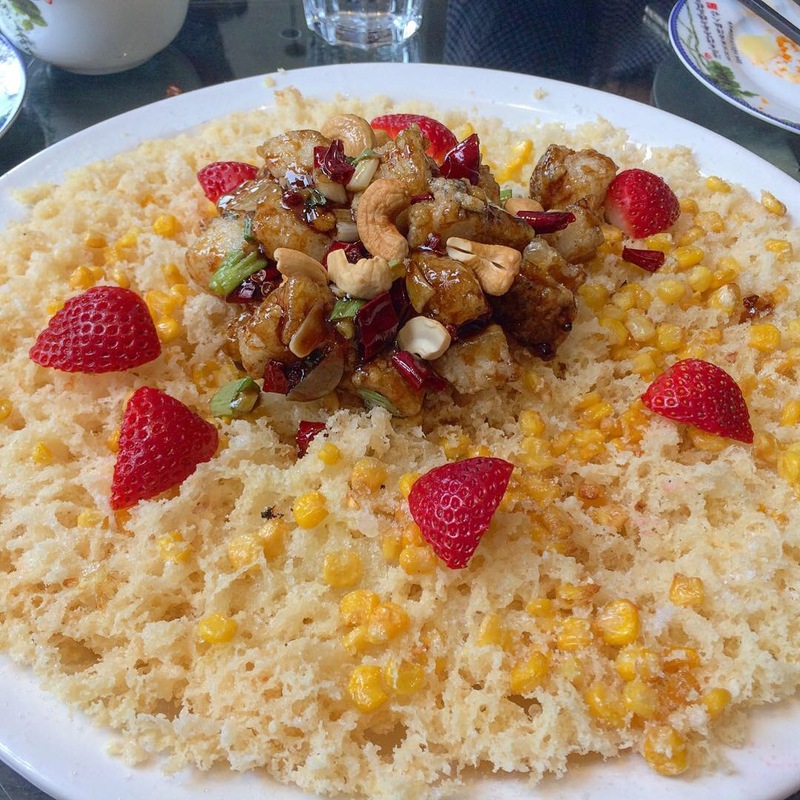 I’m not sure when shāngxīn (伤心) which I thought meant sad or heartbroken became “happy tears” but I suspect it has to do with the zesty deliciousness that this dish delivers. 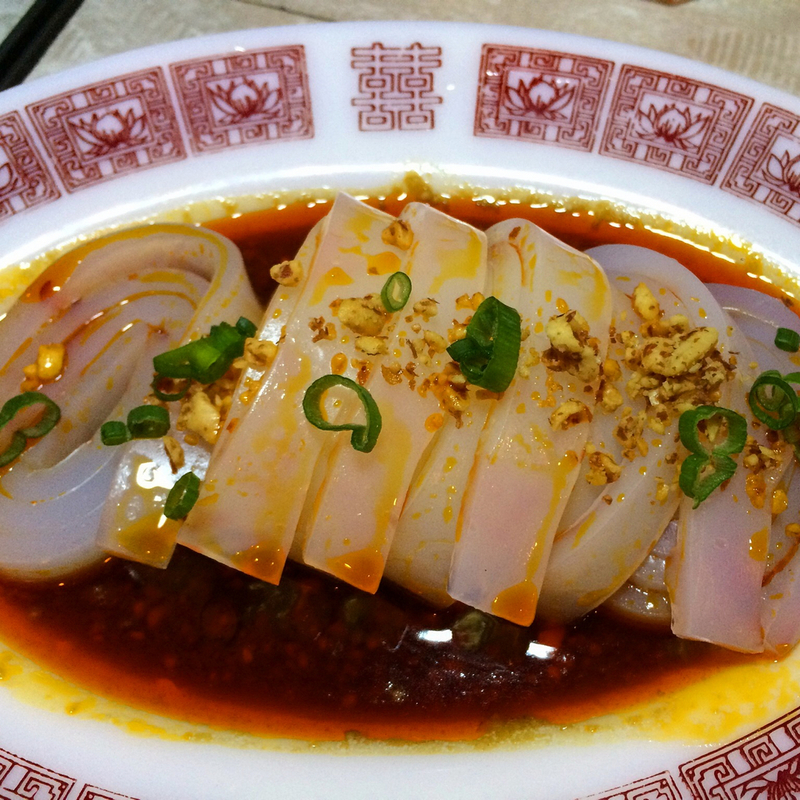 Liángfěn refers to mung bean jelly “noodles” – long, thick-cut, slippery, wobbly chopstick challengers (for some) in a spicy soy sauce based dressing. Good eats. 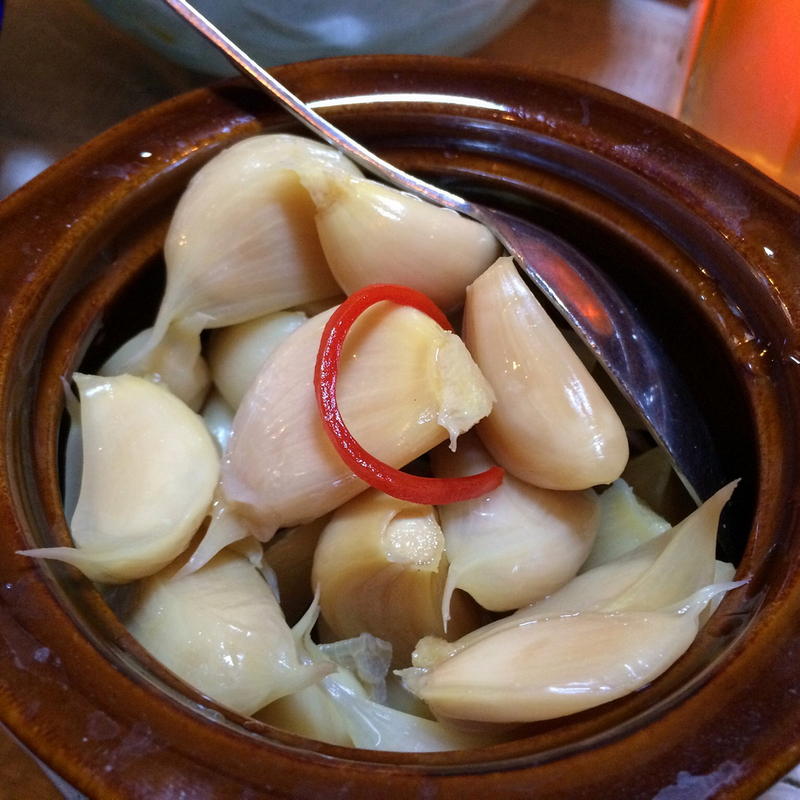 A powerful snack: Candy Garlic, 糖蒜. Think pickled, not candied – neither dessert topping nor floor wax. Of course, if it’s date night you might want a breath mint after consuming a couple of them, but these piquant cloves are approachable…with Certitude 🙃. 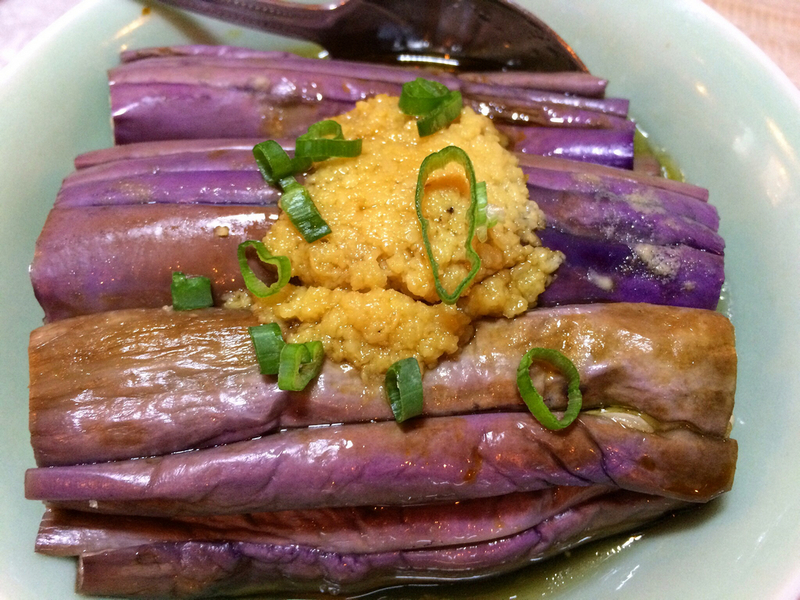 Eggplant with Roasted Garlic, 蒜蓉茄子, is a surefire winner. Eggplant and garlic seem to have an affinity for each other like chocolate and nuts, or bacon and pretty much anything. Again, MáLà Project did a good job with this one. 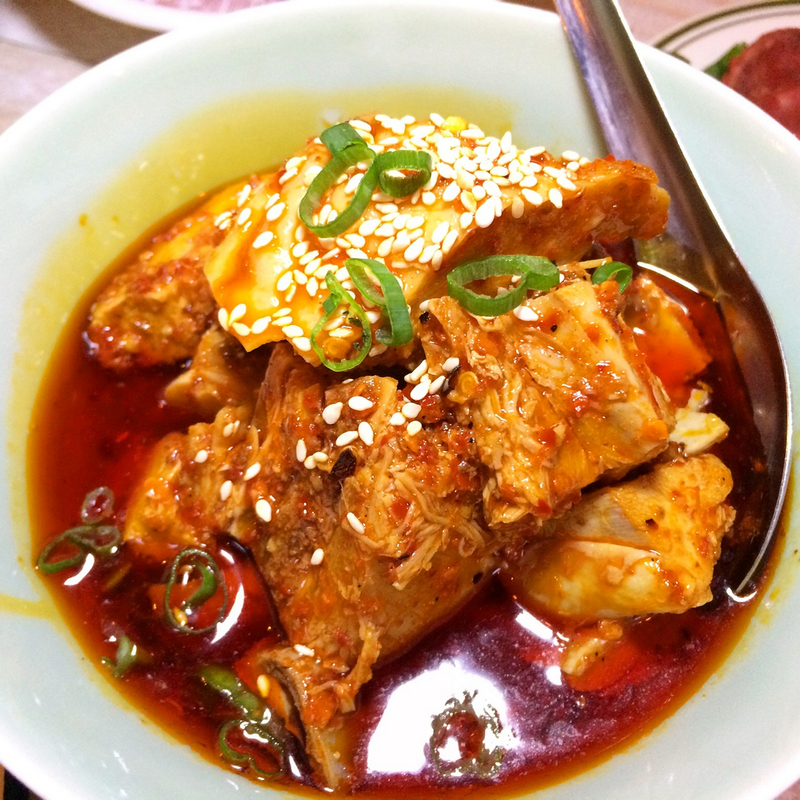 Mouthwatering Chicken, 口水鸡, another classic Sichuan delicacy. Often made with white meat chicken (one of the few recipes in which it’s a worthwhile choice IMHO), it’s poached chicken in chili sauce and this version was excellent. 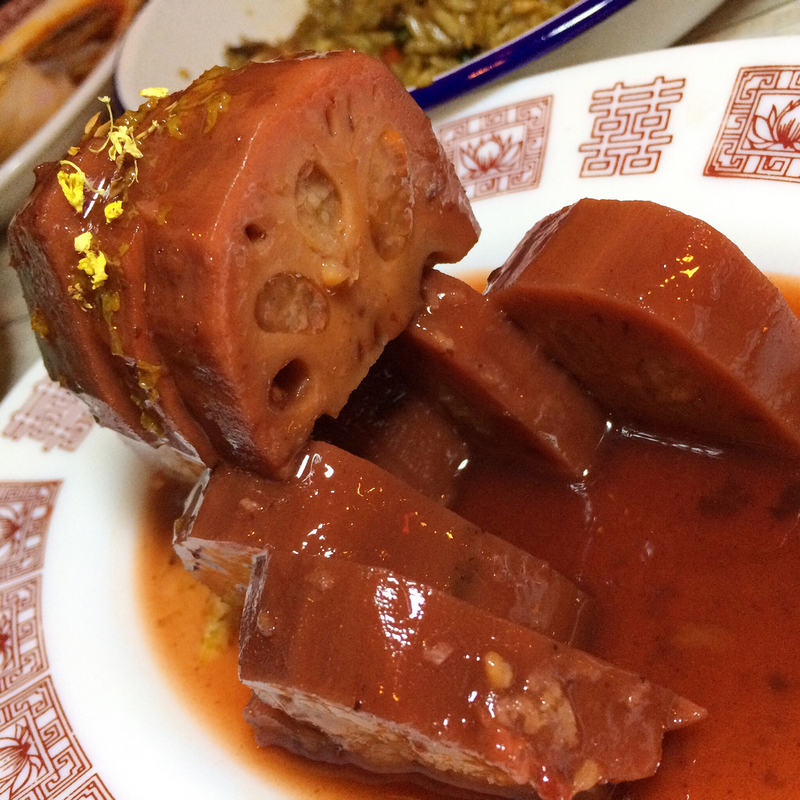 Sticky Rice Stuffed Lotus Root, 桂花糯米莲藕 was delicious. 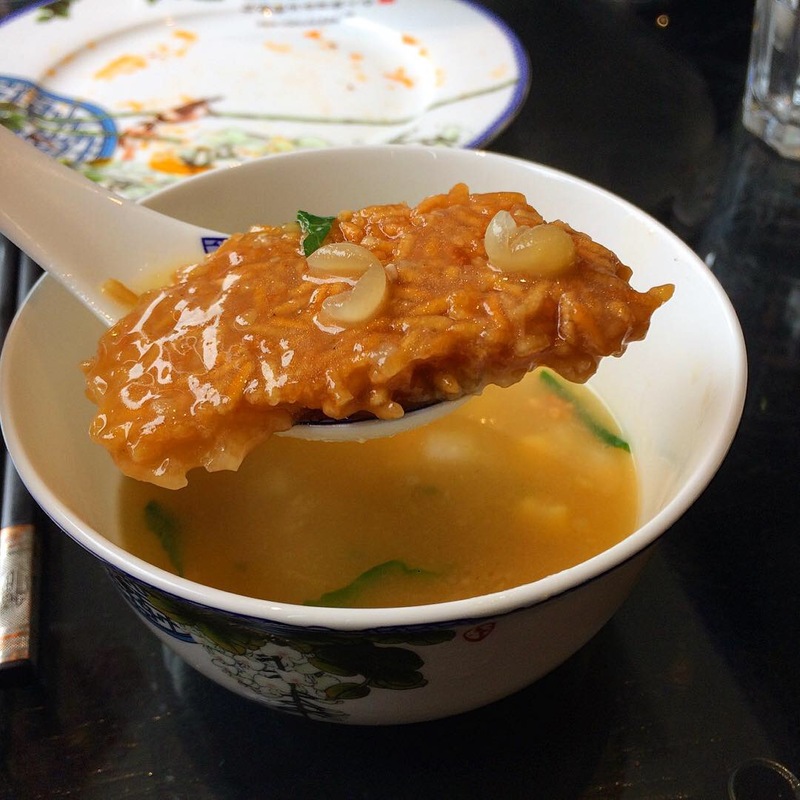 The Chinese characters read osmanthus, glutinous rice, lotus root. 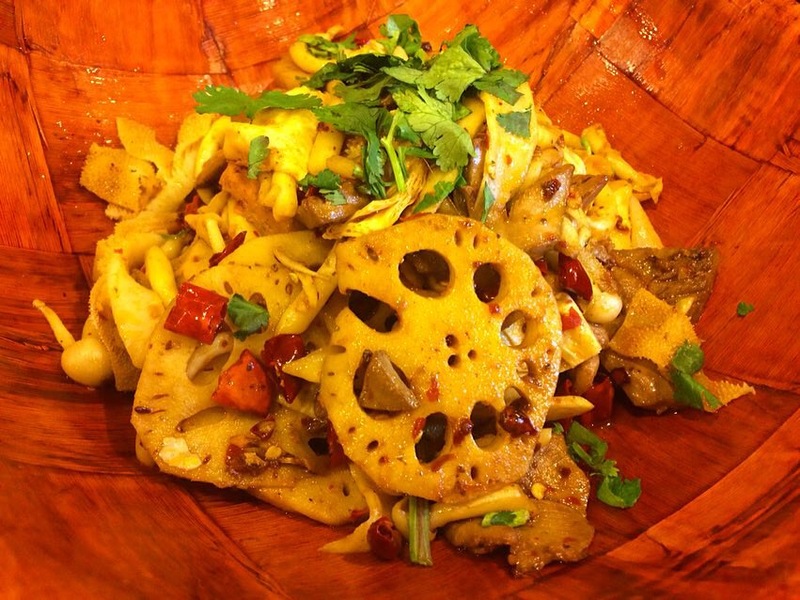 As I understand it, the cavities in the lotus root are stuffed with sticky rice and the root is simmered in a sweet syrup, often with the addition of goji berries and red dates, until tender. It’s sliced and then gets a bath in its cooking sauce for serving. Osmanthus flowers adorn the top. It’s a sweet dish, but not intensely so. Excellent. Okay. Next time, we’ll save room for the Dry Pot! MáLà Project is located at 122 First Ave in Manhattan. 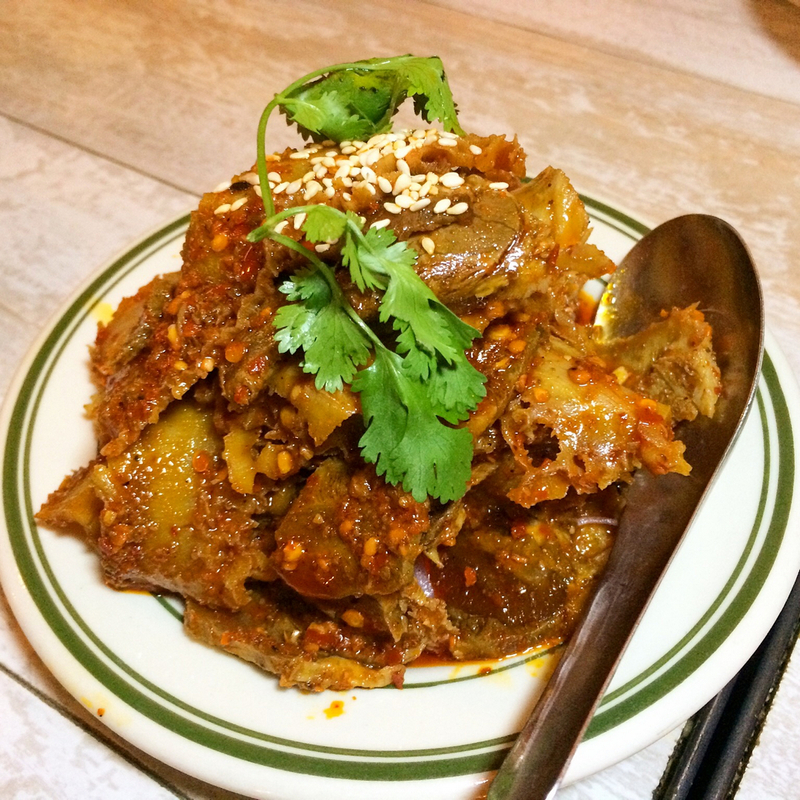 Mala Tang and Mala Xiang Guo are Sichuan dishes that are underrepresented in Manhattan’s Theater District, but those are the specialties at Manting Restaurant, 150 W49th St. We were invited to taste their renditions amid a selection of other items on the menu, and we happily obliged. 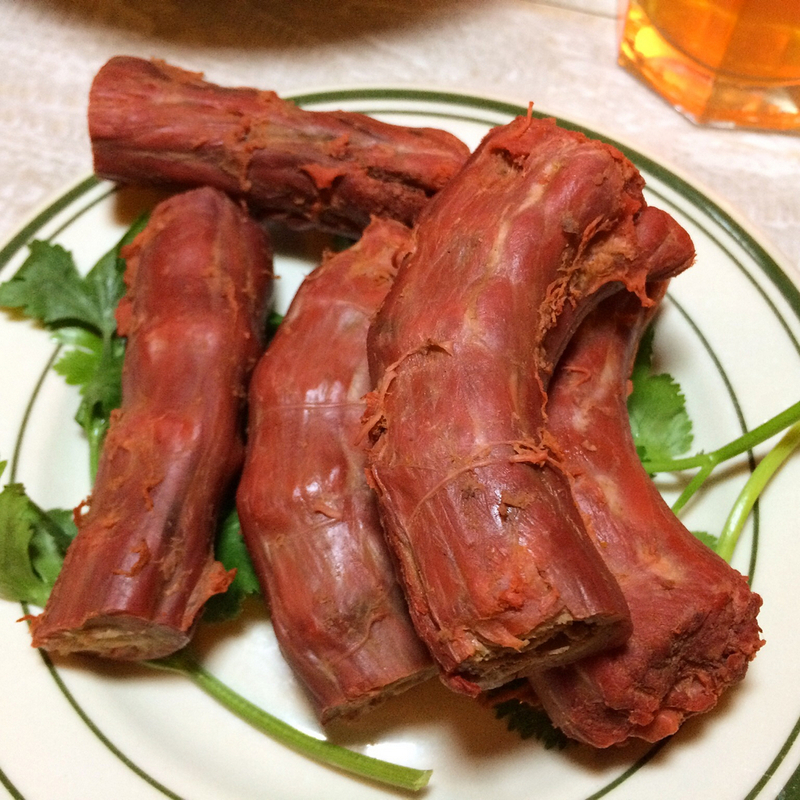 They feature eight kinds of Mala Tang, the spicy, soupy hot pot, in ready-made versions such as beef, lamb, fish (pictured), seafood and vegetable. When I see “málà”, I expect numbing, spicy Sichuan peppercorns but the best I could tell was that this was ignited only by dried red chili peppers. Not complaining though: we requested very spicy and we actually got it. Spoon some of the sauce over rice for maximum enjoyment. 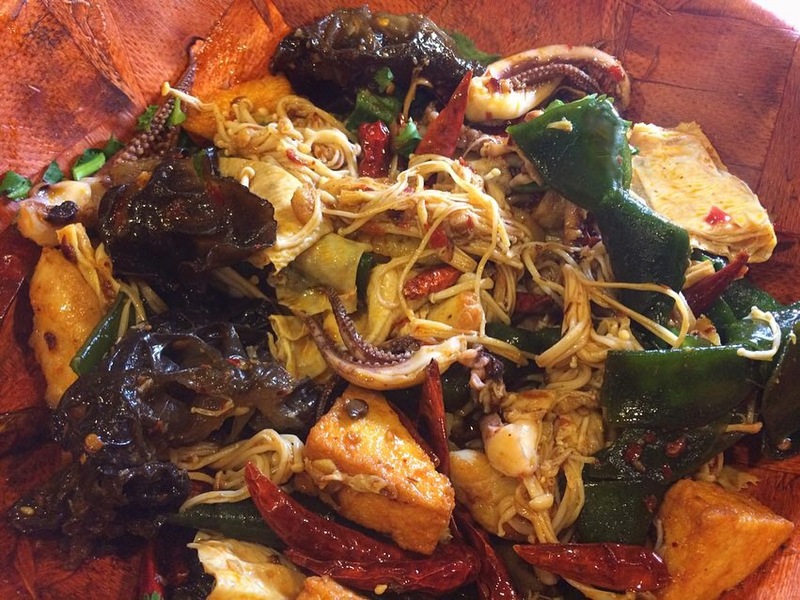 Mala Xiang Guo, spicy dry pot, is a stir fry in which diners can choose from among 35 items that include meats (beef, lamb, chicken, tripe, kidney, for example), seafood (shrimp, fish fillet, squid), and a garden of vegetables (like mushrooms, cabbage, cauliflower, seaweed) and tofu. Choose your favorites, specify a spice level, and you’re set. Read the menu carefully regarding portion size and pricing: it’s priced per pound with a 1.5 pound minimum and a surcharge for orders under 2 pounds, but you’ll probably exceed those anyway if there are at least two of you. Common sense dictates that if you request many ingredients but the size of your order is modest, you may find only one piece of something you desired in the bowl. We decided to get two of these, one with meats and  the other fish based. Both filled the bill. We opted for the Scallion Egg Pancake appetizer, sort of an omletized scallion bing. As I’ve said, Nouveau Sichuan, if you’ll permit my neologism, seems to be the craze among Chinese restaurants these days. Classic Sichuan dishes appear beef cheek by pork jowl with fanciful presentations of innovative altered-state creations on menus that would make a coffee-table book pale into insignificance. Here’s the last in a series from Daxi Sichuan, 136-20 Roosevelt Ave on the second floor of Flushing’s New World Mall, a prime exponent of the trend. 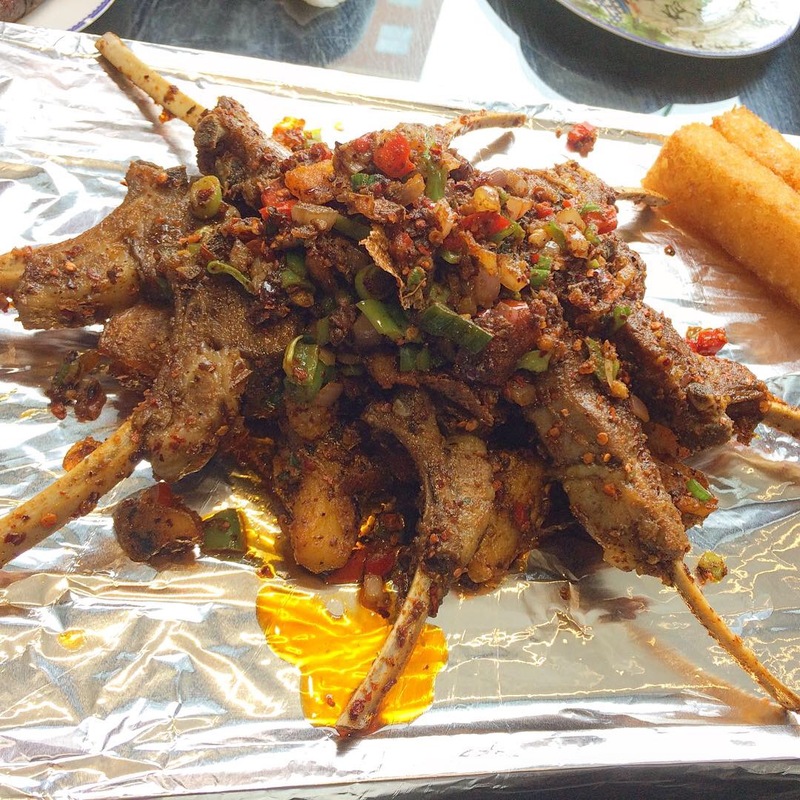 Tibet Style Lamb with Brown Sugar Rice Cake. First question: I count eight chops in compass point configuration but only two rice cakes. 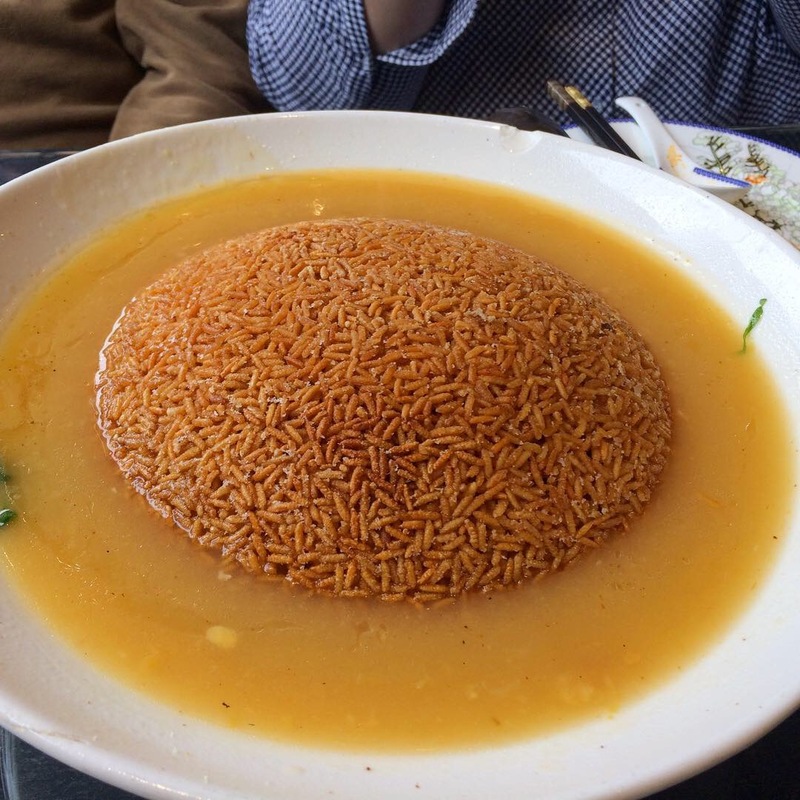 Those rice cakes were tasty – but were they intended as merely a flavorsome garnish? (Upon review, the menu depicted more.) The lamb was good as well, but the undergirding of spicy potatoes, peppers and onions was excellent. And finally, Stir Fried Cabbage and Bean Vermicelli. Gimmick-free, sans over-the-top-staging; simple, homespun and delicious. 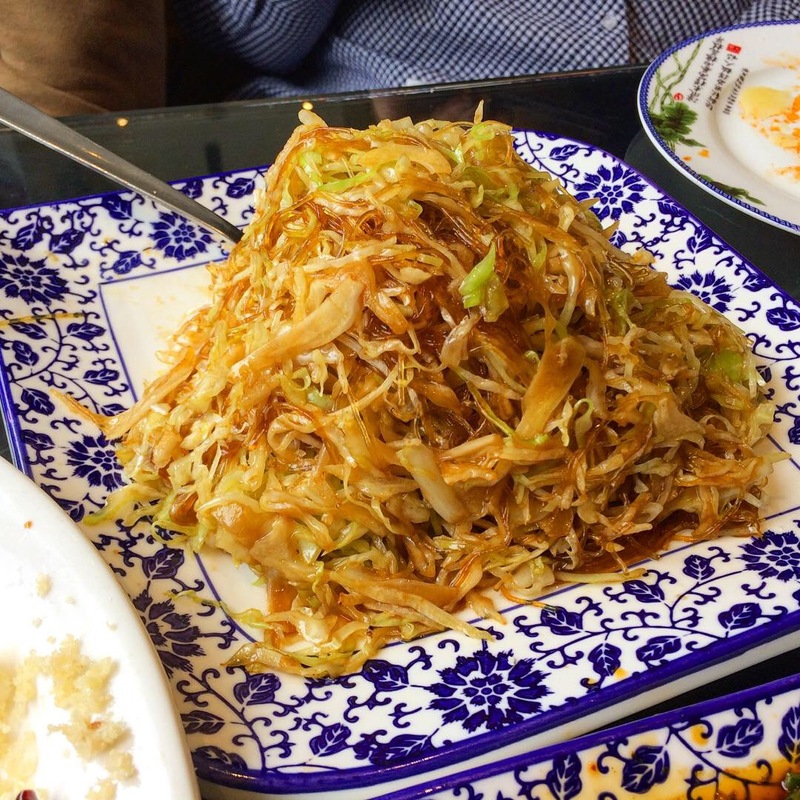 And maybe that’s the method in their madness at Daxi Sichuan; they aim to cover both sides of the culinary divide with some dishes that focus on eye-catching presentation and others that sustain us with mouth-watering comfort food. After all, they did just net a 2019 Michelin Bib Gourmand award. 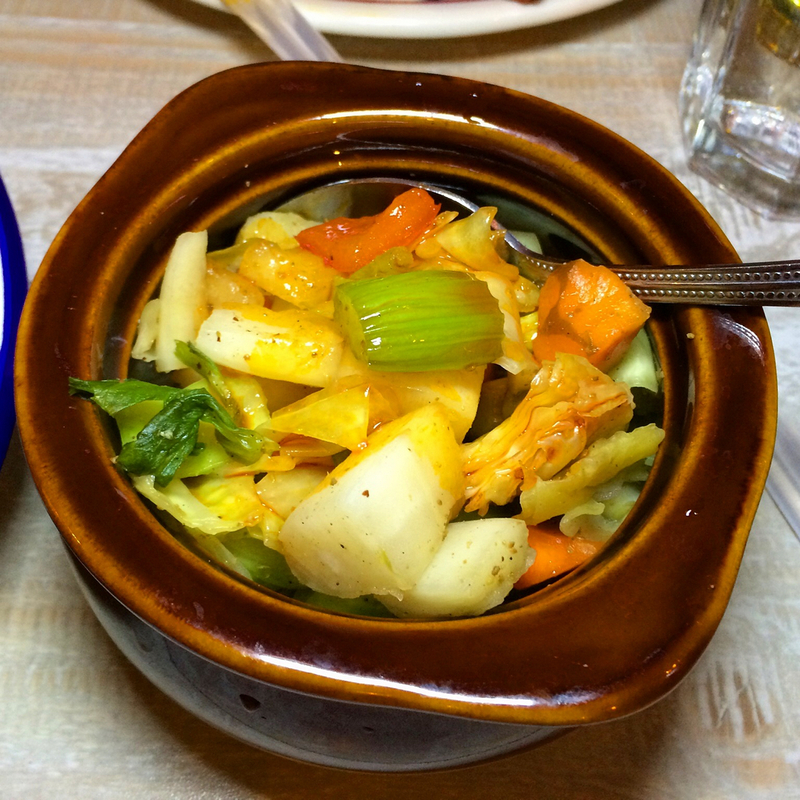 Another pair of dishes from Daxi Sichuan, 136-20 Roosevelt Ave on the second floor of Flushing’s New World Mall. Daxi wants to be known for its “modern interpretation of classic dishes” and our experience was certainly characterized by their attention to panache. House Special Rice & Cured Meat Country Style. The outsized, lavish menu enticed us with a larger than life depiction of this charming presentation of rice brimming with cured meat and other tempting tids and bits. 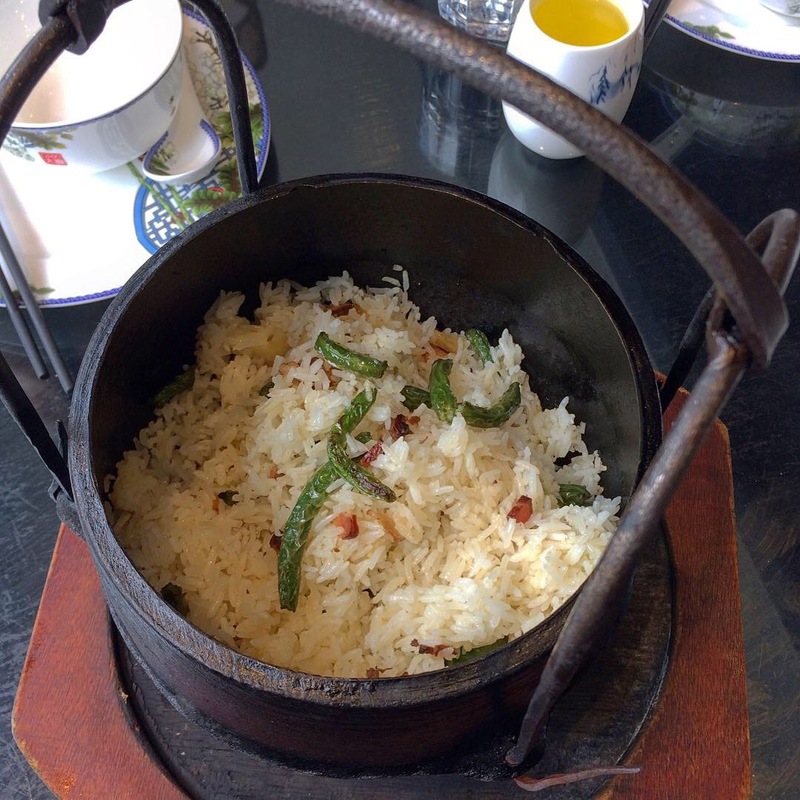 Although the cast iron pot arrived as pictured, the rice was less lavishly embellished than we had anticipated. Still, the dish was certainly good if a bit overhyped. If it had arrived on a standard serving plate, I would have been just as happy. Sautéed Pork Chengdu Style. Chinese bacon with spicy green pepper and garlic; simply produced and tasty. They do well when they’re not trying too hard to impress with stylishness. More from the Nouveau Sichuan kitchen of Daxi, 136-20 Roosevelt Ave on the second floor of Flushing’s New World Mall where creativity reigns supreme. From the unique and novel side of the kitchen, this is Crispy Mandarin Fish. I’m told that its addictive crunchy pillow is made from deep fried ground dried corn. The sweet fish with cashews (and, um, strawberries?) 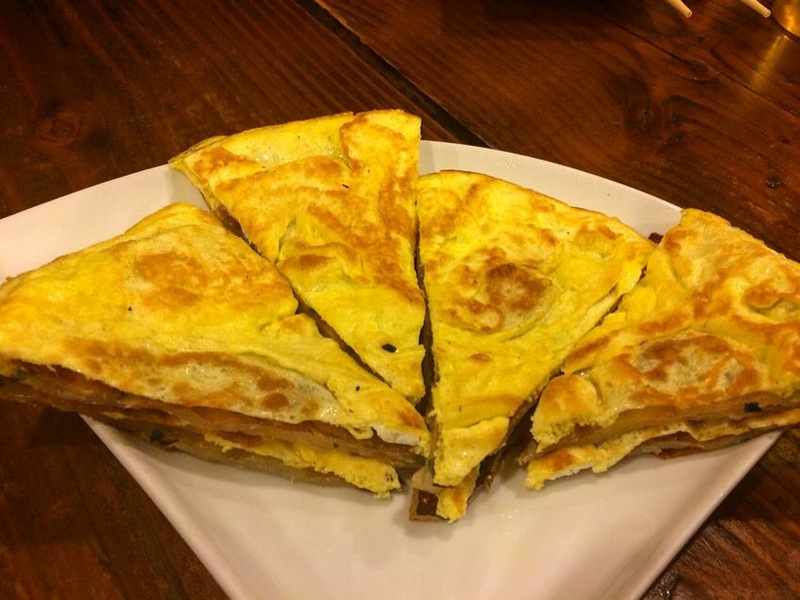 was delicious, the crumbly cushion a perfect foil for the tender meat. My only wish would be for there to have been a higher fish to crunch ratio. And from the classic side, Sautéed Kidney with Green Pepper (and red peppers too!) just the way it should be: tender and flavorful with a little kick. Nouveau Sichuan, if you’ll permit my neologism, seems to be the craze among Chinese restaurants these days. Classic Sichuan dishes appear beef cheek by pork jowl with fanciful presentations of innovative altered-state creations on menus that would make a coffee-table book pale into insignificance. Daxi Sichuan, 136-20 Roosevelt Ave on the second floor of Flushing’s New World Mall, is one such exponent of the trend. 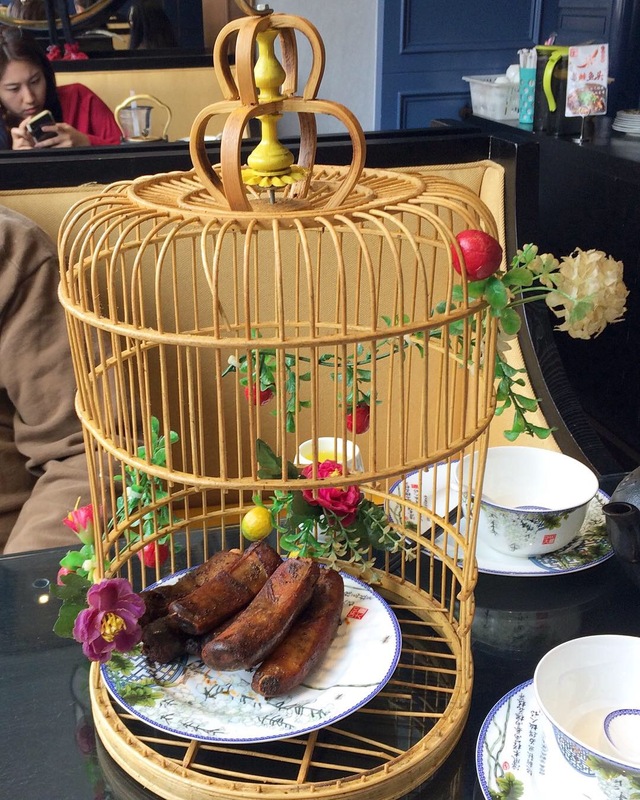 On a recent visit, we ordered the much touted Tibetan-Style Pork Ribs; they arrived in a bamboo birdcage festooned with plastic flowers. I’m not entirely certain that I get the connection (maybe it’s a pun on rib cage? ), but there they were on a plate at the bottom of the cage (where again? ), pork squeezed into a sausage casing, sheathing a rib bone, and looking for all the world like a trompe-l’oeil hot dog but tasting like a proper pork rib albeit a little on the dry side. 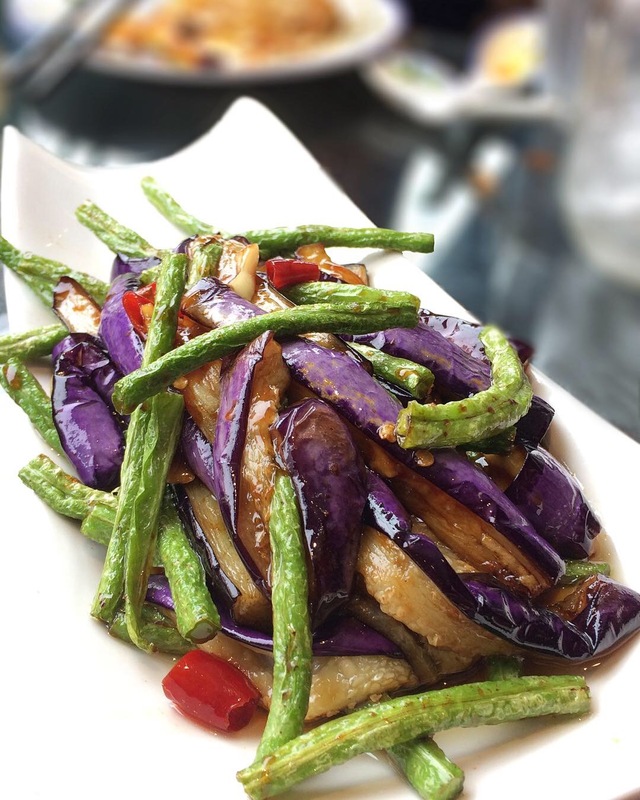 In contrast, the second photo shows our order of adeptly prepared Stir Fried Eggplant and String Beans; definitely delicious and free from artifice. I’m assuming the birdcage is unavailable for take-out or delivery. 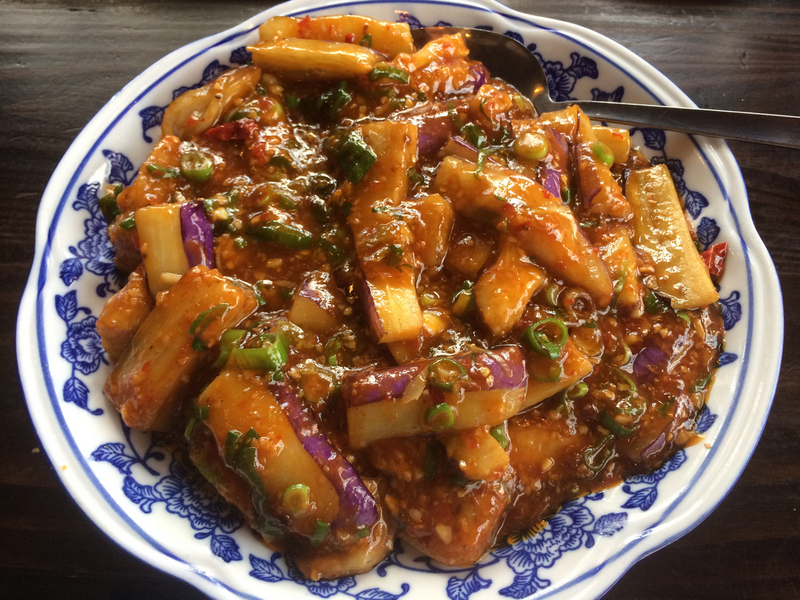 We had half an hour to spare and my friend @restaurantfairy exhorted @annegrrrll and me to meet her at Flushing’s Szechuan House, 133-47 Roosevelt Ave, for a bite before lunch (yes, we do that). 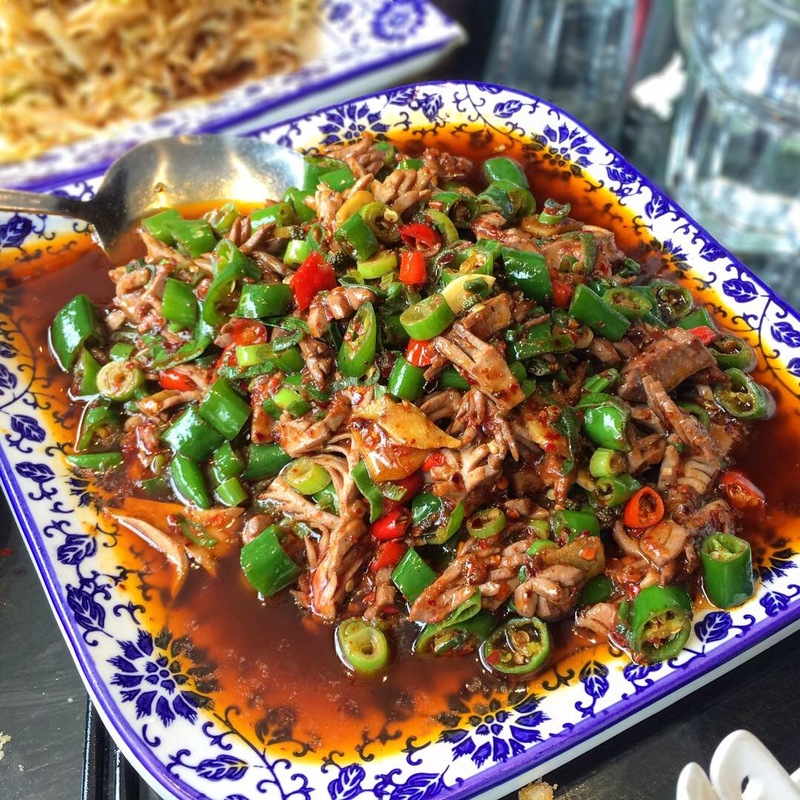 She communicated her desire for the off-menu classic Sichuan dish, Fried Shredded Beef with Celery and Chilies; it was absolutely outstanding and we devoured our pre-game snack posthaste. 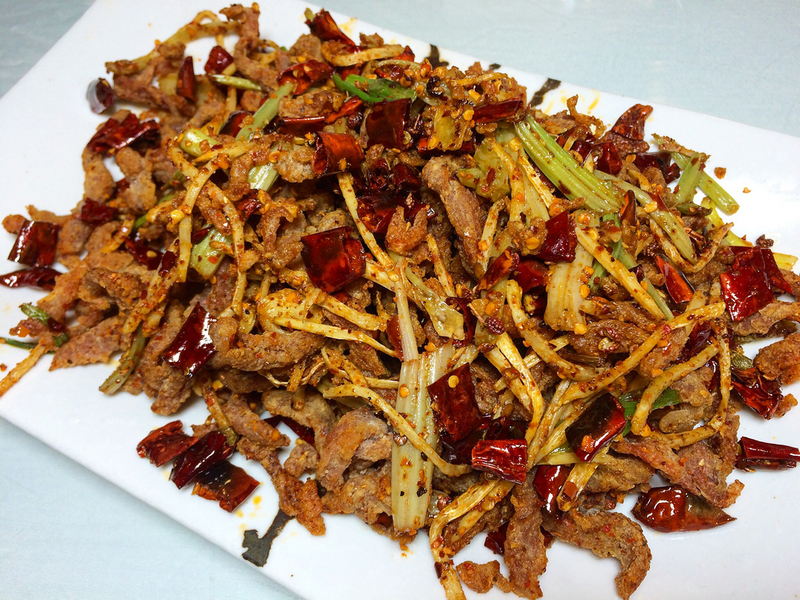 I tracked down some recipes for Gàn Biān Niú Ròu Sī (干煸牛肉丝), literally dry fried beef threads, and I’m looking forward to doing a little home cookin’ when I get the chance, but in the meantime, I know where to get more! 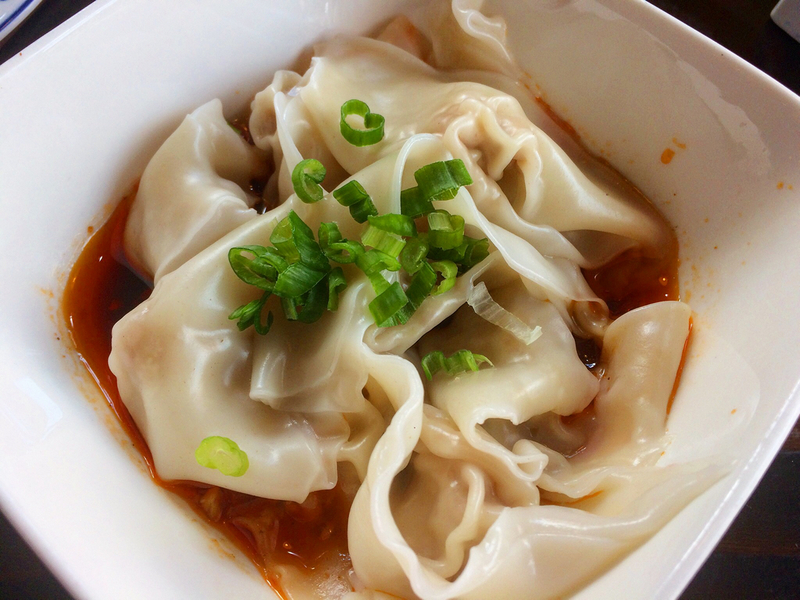 These light dumplings came from recently opened Chuan Tian Xia at 5502 7th Ave in Brooklyn’s Sunset Park. The combination of a little knowledge and more research leads me to think that menu item “Chengdu Dragon Reading Hands” (成都龙抄手) might be better translated as “Chengdu Dragon Handwriting” but that’s still not much help in determining their contents or the derivation of their fanciful name. Can anyone enlighten me? Fish Flavored Eggplant. 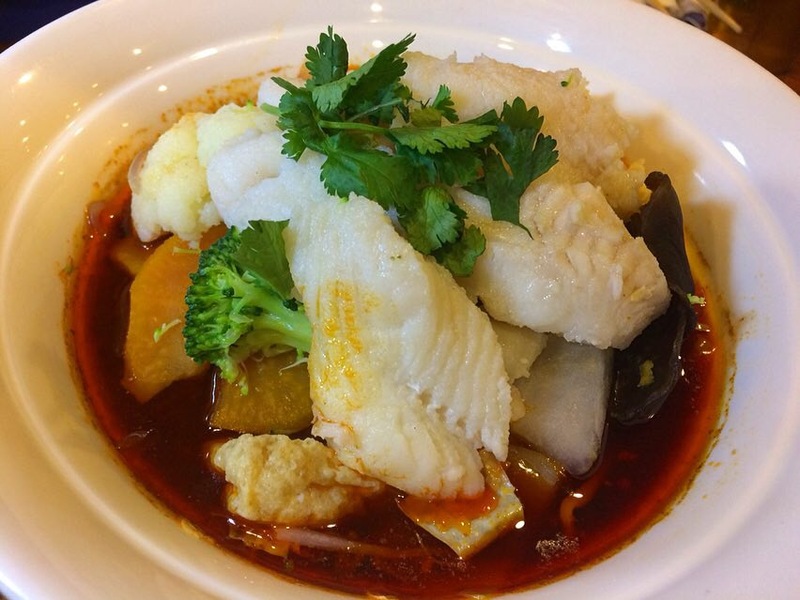 Don’t be misled by the phrase “fish-flavored” – it neither contains nor tastes like fish; rather this delicious Sichuan yuxiang (魚香) sauce refers to a combination of ingredients, a little sweet and sour, a little spicy and salty, often used in preparing fish. New kid on the block in Sunset Park, Chuan Tian Xia at 5502 7th Ave, Brooklyn, did a nice job with this one. Stay tuned; more to come….